With proximity scoring an empty point belongs to the player with the closest living stone (by Manhattan distance). The Ing 1996 rules use proximity scoring. 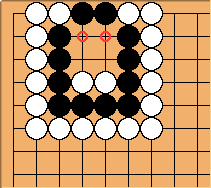 Under proximity scoring the points belong to Black.